In the defining years of creative development, Rafael Santi is located in the city of Florence. Since 1504, the artist absorbs the skill of Michelangelo and his talented colleagues Leonardo da Vinci who worked here. Prior to this, young Raphael mastered the traditions of just the beginning of the Renaissance. Now he learned a lot from the stylistics of masters whose talent was in full bloom. In addition, the painter practiced a lot in drawing, studied the proportions and plasticity of the body, mastered the contrasts of light and shadow. “Madonna in greens” – the result of this painstaking and enthusiastic study. The picture was created in 1506. It depicts the Virgin on the background of the landscape, sitting on a meadow. There are two babies at her feet: Jesus is next to John the Baptist. Apocryphal evidence suggests that the Baptist recognized Christ as the Messiah when they were children. Religious plot has become an excellent means to portray the nascent history of the great spiritual path. “Madonna in greens” lyrical, musical, moderately colorful. Young Maria, with a slight blush on her porcelain face, lowers a gentle glance at babies; love and serenity read in her guise. The boy John in a half-ride stretches a wooden cross to the standing Jesus. The curvaceous shapes of the three figures express well-being. The landscape background is traced in detail. On it along the width of the canvas stretches the water surface, towering mountains and the city. The nearest plan is filled with strokes of olive and rich green. The composition has a pyramidal design. Raphael has written several Madonnas since the age of 15. 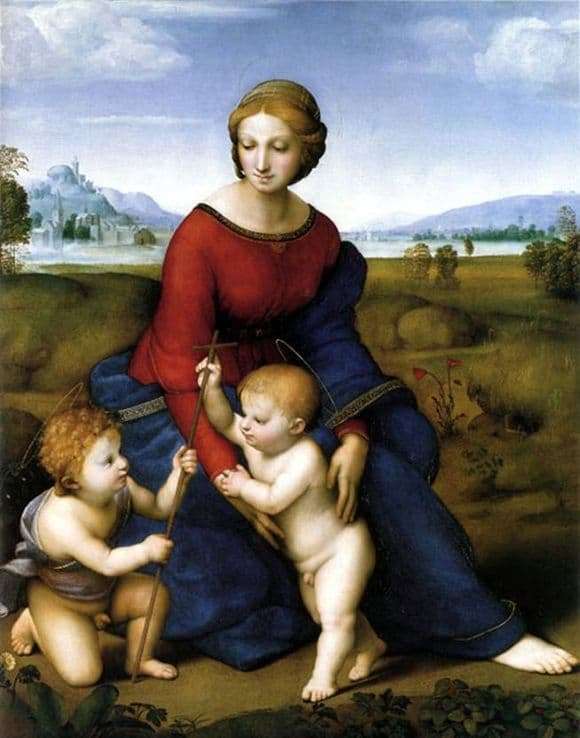 One of the best – “Madonna in the green.” The Taddeo Taddei canvas was intended to be the companion and patron of the artist, later found himself in the collection of the Belvedere Palace, and is now in the historic Vienna Museum.